Urbanization is a rapid global trend, leading to consequences such as urban heat islands and local flooding. Imminent climate change is predicted to intensify these consequences, forcing cities to rethink common infrastructure practices. 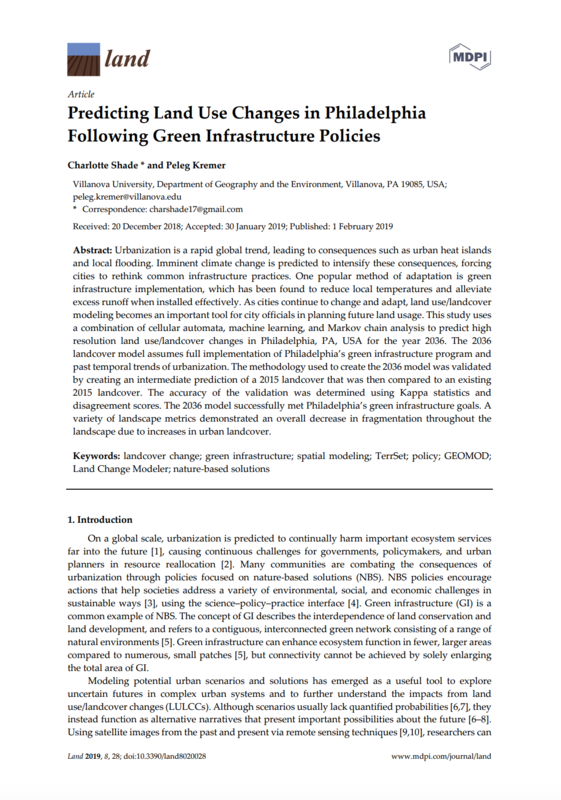 One popular method of adaptation is green infrastructure implementation, which has been found to reduce local temperatures and alleviate excess runoff when installed effectively. As cities continue to change and adapt, land use/landcover modeling becomes an important tool for city officials in planning future land usage. This study uses a combination of cellular automata, machine learning, and Markov chain analysis to predict high resolution land use/landcover changes in Philadelphia, PA, USA for the year 2036. The 2036 landcover model assumes full implementation of Philadelphia’s green infrastructure program and past temporal trends of urbanization. The methodology used to create the 2036 model was validated by creating an intermediate prediction of a 2015 landcover that was then compared to an existing 2015 landcover. The accuracy of the validation was determined using Kappa statistics and disagreement scores. The 2036 model successfully met Philadelphia’s green infrastructure goals. A variety of landscape metrics demonstrated an overall decrease in fragmentation throughout the landscape due to increases in urban landcover. MDPI AG, a publisher of open-access scientific journals, was spun off from the Molecular Diversity Preservation International organization. It was formally registered by Shu-Kun Lin and Dietrich Rordorf in May 2010 in Basel, Switzerland, and maintains editorial offices in China, Spain and Serbia. MDPI relies primarily on article processing charges to cover the costs of editorial quality control and production of articles. Over 280 universities and institutes have joined the MDPI Institutional Open Access Program; authors from these organizations pay reduced article processing charges. Land (ISSN 2073-445X) is an international, scholarly, open access journal of land use and land management published quarterly online by MDPI.